Liatris are tall, narrow spike flowers consisting of dozens of tiny fuzzy blossoms graduating down the stem. They are unusual in that they blossom from the top of the flower downward. The leaves are thin and grass like. They add instant color to tall combinations, because the flowers open from tip to base. It looks stunning when mixed with snapdragons, gladiolus, and other long-stemmed varieties. If you were to see the Liatris Spicata for the first time, the uniqueness of the flower would probably delightfully surprise you. These showy flowers are unlike you've ever seen before. With tall spikes of purple flowers that are similar to feathers or brushes, these are incredibly popular in the cut flowers trade. These spikes grow an approx one to five feet in height and grow in hardy zones, from Midwest to the East Coast and even Eastern Canada. However, they are native to Eastern North America. These lovely perennials are a genus of the Sunflower and Daisy family, believe it or not. They grow in prairies and sedge meadows in North America. These plants have only 5-6 flowers each, and the stems grow at a reasonable distance from each other. They are extremely valued when it comes to horticultural and the cut flower trade. People tend to be very attracted towards their fluffy, showy and vertical flowers. Their foliage is extraordinarily contrasting and lush too. They come in a range of colors of white, purple or red liatris flower. But the purple Liatris Spicata is more renowned than the other varieties. Interestingly enough, these plants flower from top to bottom. The bottom shaped flowers of this plant resemble blazing stars which is why they are commonly called that. Along with other names like gayfeather and button snakeroot.These tall upright flowers are drought tolerant and require well-drained, average, moist soil along with the summer heat to bloom to perfection. This self-sower is also low maintenance and disease free. They are great for attracting scores of birds and butterflies and even manage to keep the deer and rabbits away. Some of the common varieties would be the Alba and Floristan White which like the name suggests are white. The Floristan Violet, on the other hand, is a superb purple color edvariant with thick flowers and a sturdy stem. These, therefore also make fantastic cut flowers and have been used increasingly in the florist trade. If you've chosen to inculcate these brilliant flowers for the ornamental use you're one hundred percent doing it right. Liatris Spicata's can create fun, bold and bright accents that are hard to achieve otherwise. As an event planner or do it yourself bride you'll want to purchase these in bulk. This will not only save you money on your budget but also ensure that you're getting the most excellent quality. 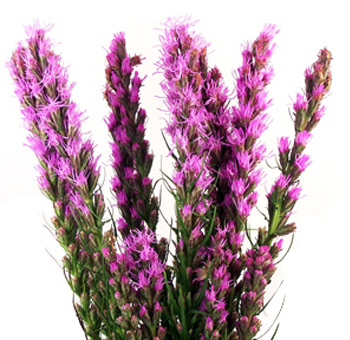 Many online wholesalers can provide you with purple Liatris spicata Flowers. But it's essential that you consider quality and guarantee provided by the vendor. That's why we suggest Whole Blossoms. An online flower wholesaler who guarantees’ not only fresh flowers but also the delivery right at your doorstep. It's a blessing for the hard-working event planners. The cherry on the top is the fact that they also have a 24/7-hour delivery system. So, whenever you are ready, your beautiful Liatris Spicata's are just a click away.